As of Sunday, the world’s largest stand alone integrated photovoltaic project was pumping out power into the grid. The building integrated PV system is located on the roof of the recently completed Hongqiao Rail Station in Shanghai. With 20,000 panels, the 61,000 sq m roof system is expected to produce 6.3 million kilowatt-hours (kwh) of electricity per year, which could power 12,000 Shanghai households. 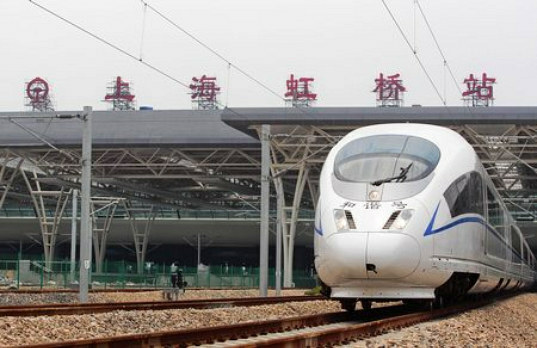 Hongqiao Station is the newest high speed rail station on the Beijing-Shanghai rail line. The station was completed and operational on July 1st and a mere two weeks later, its large solar system went online as well. Installed on the awnings of both sides of the station, the 6.68 MW photovoltaic system has already produced 300,000 kWh during testing for these last two weeks. This new solar project is meant as a pilot project to help spur on the advancement of solar power in China as well as to encourage the construction of eco-friendly rail stations that are planned for China’s high speed rail network. At a cost of 160 million yuan ($23.6 million), the new solar system will also help reduce carbon emissions by 6,600 tons and cut coal consumption by 2,254 tons. 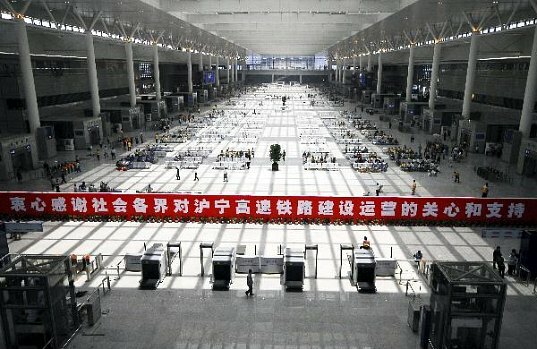 I'd just like to add one point, Not mentioned is the fact that Shanghai Metro Line 2 connects the Hongqiao Station and Hongqiao Airport Terminal 2 to the Shanghai Pudong Internatioanal Airport running through the central core of the city and connecting to the other 13 Metro lines so it's possible to travel for any district of the city to the Station or either airport now. From my home in the inner ring it takes about 40 minutes to travel to the Hongqiao complex or about 75 to the Pudong Airport so for we who don't own cars and depend on public transportation (most Shanghainese) it's very convenient. As of Sunday, the world's largest stand alone integrated photovoltaic project was pumping out power into the grid. The building integrated PV system is located on the roof of the recently completed Hongqiao Rail Station in Shanghai. With 20,000 panels, the 61,000 sq m roof system is expected to produce 6.3 million kilowatt-hours (kwh) of electricity per year, which could power 12,000 Shanghai households.